The following is for Microsoft Outlook 97. 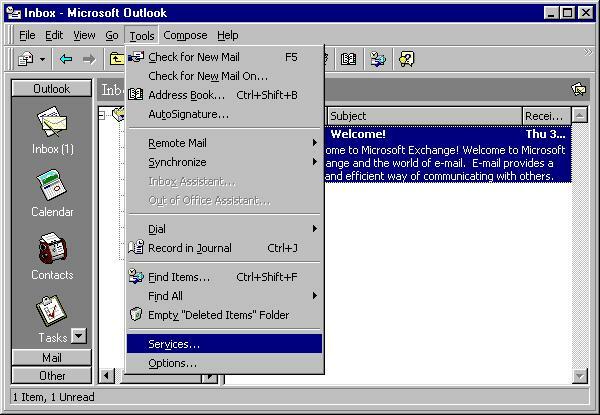 Microsoft Exchange 95 can also be set up up using these instructions. Depending on the version you are using, the pictures may not exactly match the ones below. If these instructions don't seem to match your mail program at all, try the Microsoft Outlook Express setup instructions. Outlook operates in a variety of modes. Sometimes, even if you have Outlook, the instructions for Outlook Express will more closely match what you experience on your particular computer. Open Outlook. Click Tools then Services. 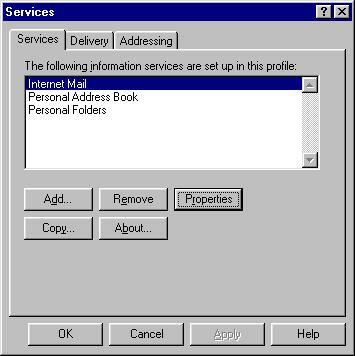 Click Services tab and select Internet Mail then click Properties. Enter your information as follows. 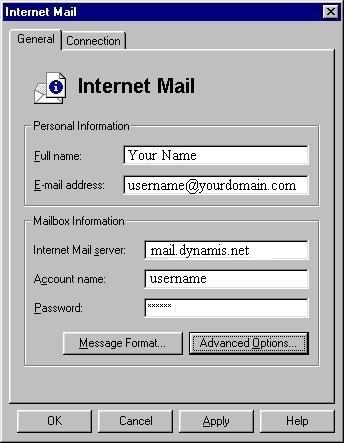 Instead of "username" use your email user name, and instead of "yourdomain.com", type your domain name, which might actually end in .com, .net, .org, or .cc, depending on what domain name you registered. Note: the domain must be hosted by Dynamis). Click OK then Click OK again and you are finished.